Sorry, sorry, I know I haven't been around for a bit. Just been lazy and not had very much inspiration to do any cooking. Plus we are moving into the new house at the end of the month and its been frantic. Yesterday evening, however, I decided to get off my arse and do some cooking, as I had vegetables mouldering away in the fridge and I hate to waste anything. I love baingan bharta, or a aubergine curry with spiced tomatoes! Its very easy to put together, and unbelievably flavourful. The grilled aubergine gives it a lovely smoky taste and the tomatoes lend it a tangy flavour. Its a good BBQ dish, as you could do the aubergines on the BBQ and make the curry base earlier, so all you have to do is mix the two. If possible, use big squishy tomatoes, as they have the best flavour. Coat the aubergine with a little oil, prick it all over with a fork and put under the grill for about 45 minutes to an hour, depending on the size. The skin should be all wrinkly and the aubergine cooked through. In a saute pan, heat the oil or ghee. Toss in the cumin seeds, and let them crackle for about 10 seconds. Add the onion, and cook for 4 - 5 minutes or so, until the raw smell disappears. Add the ginger, garlic and chilly, and stir for another 1 minute. Add all the spices, except garam masala, and stir for another 2 minutes. Add the tomatoes, stir well to combine and cook for about 10 - 15 minutes, stirring frequently until the oil separates and the masala comes together. Stir in the garam masala, and season with the salt to your taste. Take the masala off the heat and keep aside. Take the aubergine out of the oven and let it cool a bit. Cut into it and peel the skin off. The skin should come off easily. Chop the flesh roughly (Some recipes recommend mashing it, but I prefer a little more auberginey texture). Combine the chopped aubergine with the prepared masala and stir together well. Stir in the boiled sweet potatoes. Reheat for a few minutes, mixing everything together well, then take off the heat and stir in the chopped fresh coriander. 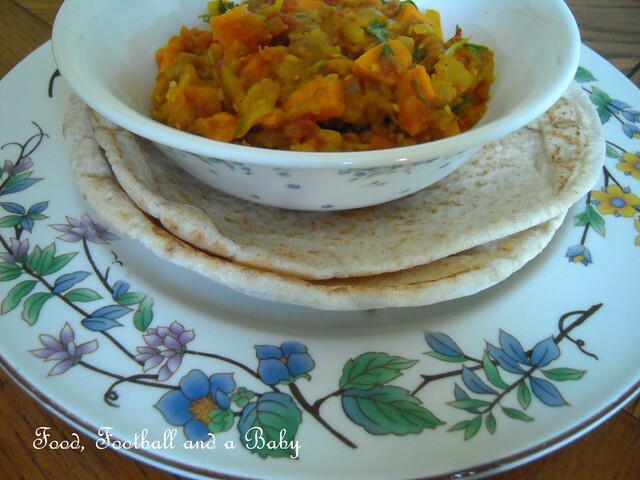 Serve with rice, pita bread, chapati or naan. PS - For just baingan bharta, ignore the sweet potatoes. Quality recipe. Am cooking it this week. Thanks. Lord above that sounds good; it'll be a week or two before I have a go at this MichBOT!, but I will, I will - defrosted some of the batch of French Onion soup recipe I nicked from your recent post and it is still excellent (but not to be defrosted in the microwave)! Just made this recipe for dinner - it's the third one from your site in the past week! Your selection of recipes and stories to go along are just fantastic.